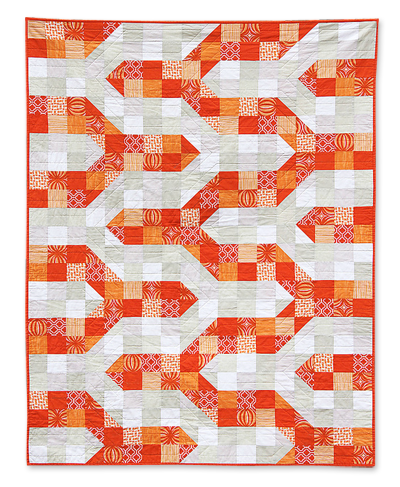 I'm not really into quilts unless they are 1) handmade by my Gram or 2) very modern, geometric, and simple. Kirsty from You Had Me at Bonjour just sent me a link to her baby quilt tutorial, and I can't resist sharing this one. It's orange and cool! Pair this coziness with a white Eames rocker* and your nursery will be looking hip. 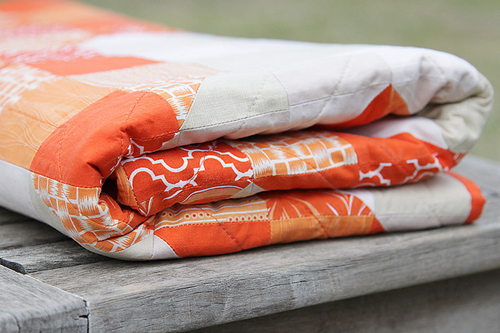 Find the quilt how-to right here. *Eames rockers are expensive and not entirely comfortable, but will increase the odds of getting your nursery featured in a decorating magazine. The top priority of every new mom, I'm certain. I love this quilt! I have been dying to make one. Thanks for sharing this tutorial! Probably wouldn't have found it otherwise! Your comment about the rocker made me giggle. It is so true!! i. am. in. love. this is outstanding!!! i must make this!! Love that and what yummy fabric! Striking quilt! I'm definitely going to look at the tutorial now. Right now! No, I'm pulling you over to the bright side! Hooray! oh my word! that is awesome! quilters have so much talent. I love this quilt! It looks more like someone was trying to simplify putting grain elevators on the quilt for a farm momma... I love some of the great ideas you have on here! Thanks for taking the time to share with us! Great quilt! Thanks for sharing. Orange and traditional Asian repeating patterns; what more could a girl want in life? Beautiful quilt and very true about the rocker. I bought one when I had my kiddo - used it for about two weeks before succumbing to the standard glider. The eames rocker now sits prettily without much rocking. Eames rocker was a great addition to our nursery, mostly because my toddler believes it is exclusively for his raucous renditions of row,row,row the boat. Mama is not allowed to sit on it! Very inspiring and love all that orange. is there a secret to making quilts modern looking? or is it just an "i know it when i see it" kind of thing? Simplicity is a hallmark. Large areas of neutrals or solid color instead of a million tiny pieces of busy floral print fabric. Check out some of the work by Jacquie Gering or Denise Schmidt.